Andrea Fantoni (1659–1734) was the most illustrious member of a family of artists active mostly in the province of Bergamo from 1680 to the end of the following century. Between 1704 and 1705, at the request of the Canon Penitentiary Giovan Pietro Mazza, he produced an extraordinary confessional for the city’s cathedral of San Alessandro. 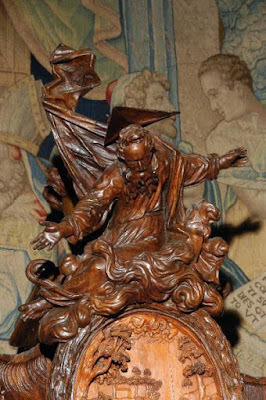 From the summit, God the Father descends in billowing clouds, craning forward with arms outstretched as if to gather the whole world into the confessional, as the cloak flapping upward suggests an immense downward energy. Fixed behind him a large globe burns with a seven-part flame, perhaps representing the seven Sacraments. The Father’s form melds into a wreathed oval relief of the Traditio Clavium, a reminder of the Lord’s words “I will give you the keys of the kingdom of heaven, and whatever you bind on earth will be bound in heaven, and whatever you loose on earth will be loosed in heaven.” This frontispiece set directly overhead of the confessor announces the source of his Sacramental power. On the same level, ranged around the corners, are four figures representing the Virtues of the Confessor: on the left at back is Mercy with her open arms, in front Wisdom, looking studiously on a book, perhaps the Bible. On the right in back is Discretion, a robed man with finger held to his lips, indicating silence, the Seal of Confession. At front, a woman tenderly fondling a lamb is Meekness. The priest’s box is decorated with great honor and vested with layers of symbolism. The door bears a large bas-relief panel depicting Christ raising the son of the widow of Naim, a Scriptural type for the Sacrament. Two panels cover the confessor’s face as he inclines to one side or the other, so that, most appropriately, his person becomes anonymous, disappearing behind the symbols of his ministry. On one side is a personification of justice, an angel holding scales; on the other, mercy, one woman pardoning another who kneels just like a penitent. The presence of a type of Christ over them makes it clear it is truly He who dispenses the penitent, and that His mercy wipes out all sin. Finally, barely visible in the ceiling, the Holy Spirit descends in the form of a dove. Two larger symbolic figures stand on either side of the priest’s box, covering the penitent’s alcove with the unfolded halves of a veil fixed above the priest’s box: on the left, a woman bearing a cross, symbolizing penitence, and on the right, a man stepping on a globe, symbolizing contempt for the world. On the left side penitent box, above the grille is a Pietà, and to the side a scene depicting the penance of Mary Magdalene. The right side has an image of the Scourging and the Penance of St. Margaret of Cortona (1247–97), a Third Order Franciscan whose cult had just been approved by Rome in 1653. The true purpose of sacred art, as of good theology, is not to say something about God, but to be a medium through which the believer can participate in the realities signified by the work; ultimately, to insert us into the ongoing action of the Mystery of Christ. Faced with the mysterious symbolic world of the Sacraments, the Christian is called to penetrate into their inner meaning with the help of grace and spiritual teachers, attentive and receptive to the ongoing divine intrusion into our world. Christ has not left us, but is present under the veils of the liturgy. Our job is to discover Him there, where he invites generous, attentive souls to understand his plan of salvation. This confessional presents the Mystery of Penance attractively. The overwhelming approach of the Divine Mercy is a gesture of love offered to raise and ennoble human nature, to satisfy man’s perennial thirst for reconciliation. The moving scenes of penance, the raising from the dead, the Father’s earnest descent, all speak with the voice of a loving father to the human heart that craves forgiveness. This is not a dry treatise on mortal sin, on the conditions of contrition, etc. It presents the Mystery in its grandest outlines, through the two noblest media of Scripture, exquisitely brought to life by the artist’s hand, and the human body, whose dramatic poses cut straight to the heart. A man cannot help but want to “jump into” this stream, the Mystery of Penance flooding into the world. 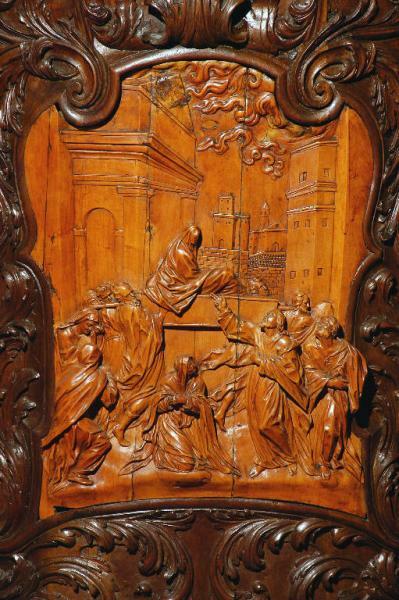 The master artist, in true Baroque style, had brought his material to life in several complimentary, dynamic motions, each expressing the grand arcs of the sacramental action. The downward might of the Father’s merciful love—accentuated by his flying tunic—incarnate in the sacrament of binding and losing, is complimented by the upward movement of the rest of the confessional: the arch above the priest’s box, the Virtues which seem ready to float off to heaven, the two steps up to each alcove. The confessional isn’t just a static object, but a surge of energies performing the Sacrament of Confession. Observe how simply and effectively the Confessional invites the penitent to consider the dispositions proper to him; and even more, generously offers models to help him achieve them. We see the image of the widow of Naim. The guilty heart starts as it recognizes itself in the dead man whom Christ would raise. This moves us to compunction, hatred for sin, love of Christ, confidence of forgiveness all at once. The priest’s box reminds us of the grave judgment God must make; but the Virtues comfort us that the priest too is held to a celestial standard, that we should have confidence to expect Christ himself speaking to us. When we kneel at the grill, recalling our sins, the engravings help us identify them with Christ’s terrible sufferings, and move us once more to repentance. Outside, the mood is welcoming, gentle: even the warnings are muted, inviting the sinner earnestly but gently to reconciliation. Inside the box is a space of austerity and simplicity; the penitent is not distracted by superfluous decoration, but given solemn examples of penance, and reminded of Christ’s expiatory death on his behalf. The departing faithful is confronted with the large figures of penance, reminding him of the Mystery he must now live. From beginning to end, the confessional shepherds the souls safely through this awesome sacrament. 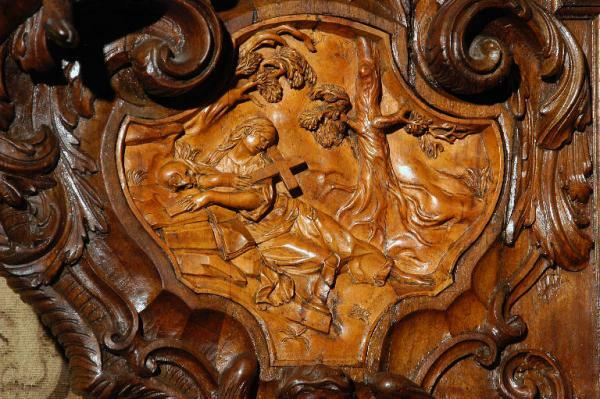 This embodied, affective, mystagogical experience of the sacramental mysteries is made possible by a truly sacred art. So many committees and initiatives, so many silly slogans and useless pamphleteering could be avoided if more serious attention was given to the transformative power of sacred art that speaks more profoundly than words. There is no part crafted with more care, guarded with more layers of symbolism than the priest’s box. He literally disappears behind the symbols of justice and mercy; the Scriptural types God revealed as the definitive lenses through which to understand this sacrament shroud him like a cope. The minister is the individual priest, a fallen man like us, but through him we are compelled to see Christ effecting our recreation by grace. The great honor paid to the decoration of the priest’s box helps us see the majesty of the priesthood. 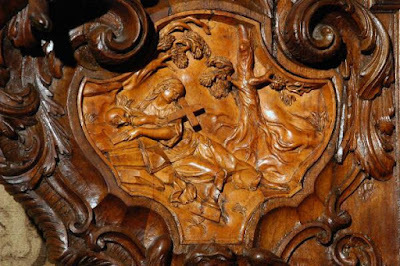 The seriousness with which the confessional treats the reality of sin and justice is a strong antidote to a worldly spirit that treats sin with indifference, and so makes man’s life little different from a beast’s. The priestly medium is the only way to avoid this life-in-death of indifference, and allow God to raise us to the glories of supernatural life. Compare this image of the priest, the dispenser of the life-giving waters, to that conveyed by one of the new reconciliation rooms that look like a psychologist’s office. Does such a place insert our minds and hearts into the divine Mystery? 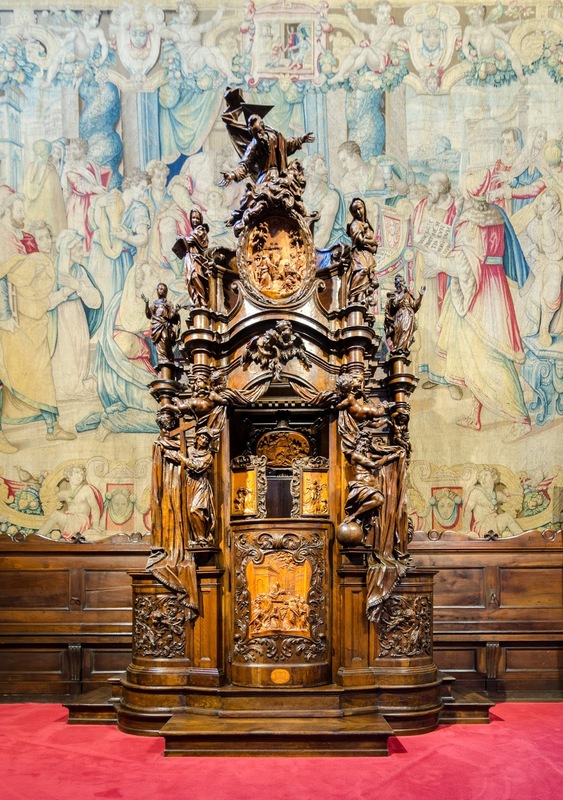 This Confessional draws us into the Mystery of Penance. Too often we look at confession as merely the chance to remit a number of sins, to restore us to a state of grace, or even a legal reunion with the Church. This is all true and good. But in its deepest reality as a Sacrament, it inserts us into the Mystery of Christ, into a Mystery of repentance. Penance doesn’t stop with the three Hail Marys: it is an entrance into the Mystery of the Father’s boundless mercy, a mystery that involves our whole lives, that embodies a whole way of life. The confessional itself is an impressive embodiment, recapitulation of this invitation. It helps us see the full proportions of the Mystery we enter when we enter the confessional: it is Christ’s cross, in all its cosmic grandeur. We don’t have many expressions of repentance in our cultural imagination. The raw force of the word “contrition”—ground to dust!—was understood by the Ninevites, who put on sack-cloth and piled ashes on their heads. That is repentance! The figures of the repentant saints helped us to see how the depth of our sorrow should even wrack our bodies; why are we ashamed to beat our breasts or prostrate ourselves on the floor? 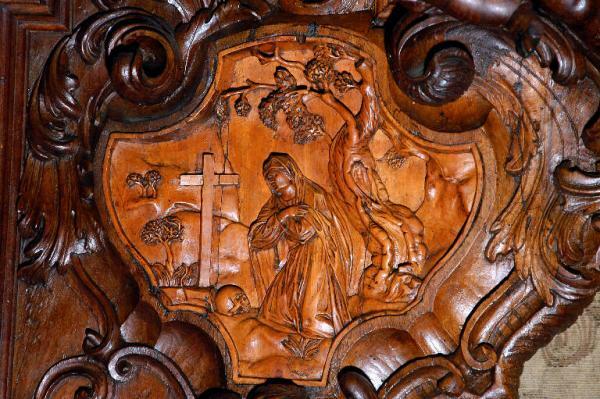 The dramatic figures here teach us the meaning of penance meant, beyond mere notional regret. 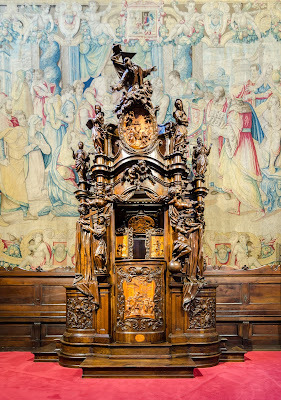 The dense symbol-scape of the Confessional of Bergamo furnishes an excellent material on which educators could base a course of mystagogical catechesis on the Sacrament of Penance. By leading students carefully, prayerfully, through personal exegesis of sacred art, the Christian initiate could learn to be attentive to the ongoing Revelation of Christ in the world through the liturgy. He must be built up into the mysteries of Christ presented in Scripture and liturgy, and act them out for himself. They must become the form of his life. That is the essence of the Christian life, and that is precisely what sacred art tries to do: to incite us to conform ourselves to the Form through forms, and become fitting vessels of the Holy Spirit.